I spoke to The Berrics about my involvement in 'The LB Project', a skateboard painting collaborative project by Lucas Beaufort. I worked with Ben Colen and Brian Anderson. All proceeds went to charity. My World Cup 2018 GIPHY project got reviewed by INT in April 2018. 'Canvas' feature in Thrasher Magazine, March 2014. I presented some of my work from that time and Chris Morgan of Science Skateboards took a photo of me and did the write up. Interview with Ballpit Mag from May 2018. Why are my characters always smoking? I speak to CAF about that sort of thing, along with some advice for young creatives. Studio visit photos and interview with app Depop from 2014. Beach Meets interview, 2016. 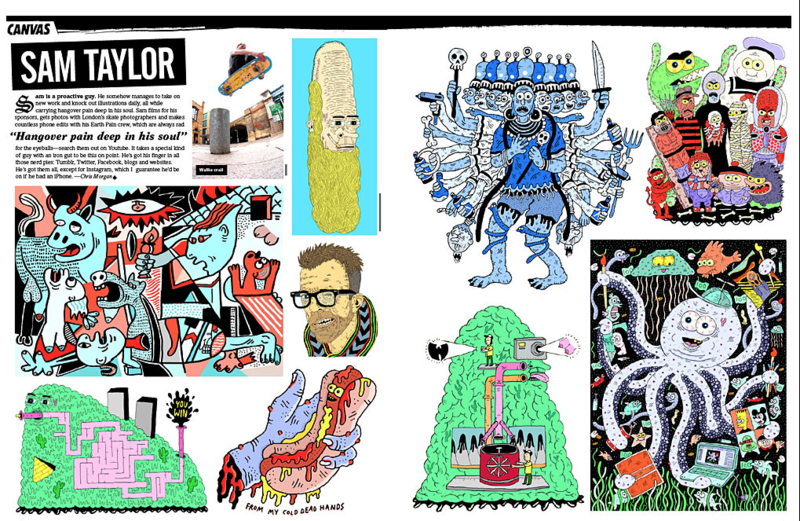 I spoke to Charlie from Beach about my Slime Zone cartoon in NME, skate culture and commercial work. It's Nice That feature on my illustrations for T3 Magazine, 2017. Some recent (2017) work featured alongside a nice write-up. Promarker drawings were featured on AIGA towards the end of 2018. I spoke to HUH Magazine about the Converse 'Made By You' campaign, my work for the campaign and a bunch of other stuff. Like Biker Mice From Mars and wanting to design a Happy Meal toy. A feature about my Slime Zone cartoon on INT. I spoke to them about the project and there's a gallery of images from that time.